King George VI died on the 6th of February 1952 and it became obvious that stocks of the George VI stamps should be used up. 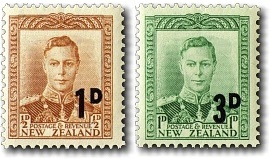 In December of that year an increase in postal charges were met by surcharging the George VI 1d green stamp 3d. In September 1953, an over-supply of ½d brown George VI stamps were surcharged 1d to use them up. This was the second time that stamps from the 1938 King George VI issue had been surcharged to cover increased postage rates, the first was during the Second World War. Those stamps are listed separately under 1941 King George VI Provisionals.